The most complex industries operating within the UK are creating huge obstacles for smaller business owners and managers trying to succeed, with their complex processes and compliance requirements. Fear of falling foul of regulation has created a certain reluctance to digitise and modernise within the field, despite the fact that technology can completely transform previously arduous processes. I’ve worked with a number of clients who tell me the most time consuming element of their work is dealing with a growing mountain of required paperwork. This is where technology could and should be embraced to empower and streamline your business, freeing up valuable time. Dealing with any transactions for suppliers and customers alike can often result in the need to provide multiple copies of documents. Even within the business itself the desire for fast accurate data never seems to let up. At face value, this never appears to be a particularly taxing element to any job. 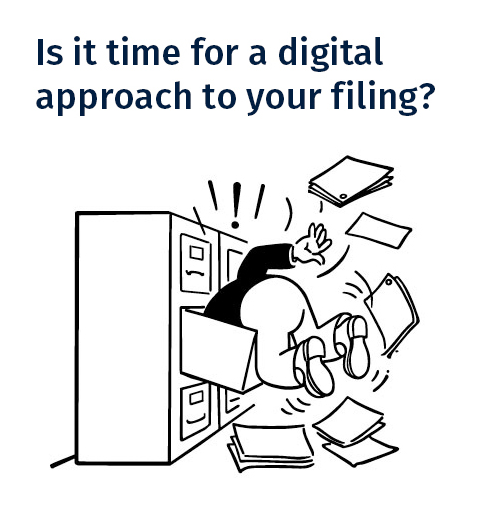 However, multiply the process a number of times per day, then factor in having to manually search through electronic filing or even physical filing cabinets and you realise how time consuming the process can become. Storing files is also rife with potential problems. No matter how precise and thorough your processes are, humans can make mistakes. Storing hard copies of documents relies on a robust and meticulously managed system, the electronic versions even more so. Fundamentally, it’s unsustainable because an ever increasing flow of paperwork combined with changing workforces and differing approaches creates a muddled jigsaw effect making it increasingly difficult to access important information and documentation. There are also legal implications. Clients I speak to often tell me that rules and regulations have become increasingly tough putting more pressure on them to deliver accurate information and reporting when requested. Picture the poorly managed filing system allowed to fall into a disorganised state. Then, picture you being asked to provide a number of historic documents, which nobody has adequately filed or labelled. It could become a costly lesson in how not to run a business. The organisation of documents and files doesn’t need to be a daunting process. Using the right technology in the right way can future proof your organisation and protect you from legal and regulatory threats. In fact, even digitisation is an outdated and over used word. When we consider nearly all documents start their life as digital, we must ask ourselves why do we still insist on printing documents to process and then file? The first step is to speak to experts who can assist you by creating a professional document management system that handles both electronic and paper documents, whilst removing the need to have someone physically file. The mountain of paperwork that you already have will quickly become a distant memory. Step two involves implementing smart software that reads and effectively manages the data in a manner that even the best humans would struggle to match. As I’ve said before, the technology is there and can do the complex and the repetitive day to day work that we simply find difficult or mundane. The final step is by far the simplest – allow the technology to work for you. You now have a new employee within your team. Digitally storing important files such as contracts, certificates, invoices, in fact any document means they can be easily accessed with the click of a mouse. The implementation of this relatively straight forward, cost-effective system should mean the management of data within your business will be reduced from days and in some cases weeks to minutes, if not seconds. Business process has and will always be focused on the movement of data between different organisations and people – regardless of what that business does. As we all face increasing competitive and regulatory challenges we need to respond accordingly. The best approach is to create an efficient, streamlined and future-proofed organisation that leaves you reassured and unties your employees allowing them to deliver a more effective business. To find out how your business could benefit from a Document Management solution, get in touch on 01285 810606 or email info@yourdms.net – we look forward to talking to you.